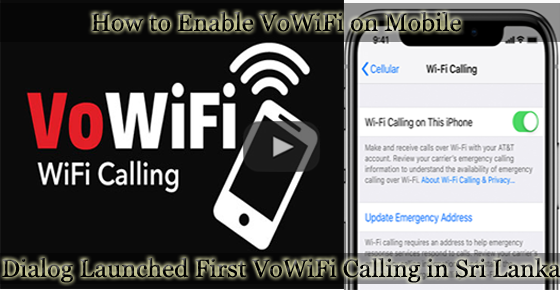 WiFi calls (VoWiFi - Voice over Wireless LAN) use a wireless network to make a call or send a message instead of sending it over the cellular network. This can be very useful when you are on the edge of a mobile network and the reception is bad. It also works very well if you are in a building that can prevent the signal from entering, especially in the basement. This technology allows users to make and receive calls over WiFi without having to connect to a mobile network. Calls are made using the standard dialer without using any additional application. You can get full explanations and how to use this technology on the video above. In general WiFi calling is free service. You do not need to add a special package to your existing plan. You will just need to be on an operator who supports WiFi calls and also use a compatible device. Many smartphones are compatible with WiFi calls, but it depends on your carrier which models are available. iPhone 6 and 6S, iPhone 6 Plus and 6S Plus, Samsung Galaxy S6, S7 and Note5, Samsung Galaxy S6 Edge and S7 Edge, LG V10, G4, K7, G Pen, Blackberry PRIV and some new models of Huawei (Huawei NOVA 3, Huawei P20 Pro, Huawei P20 Lite, Huawei P20) are just a few of the phones that support WiFi calls. For even better WiFi calls, the video will explain the settings of your router and help you optimize the quality of your calls. This will improve the clarity of your calls and make the use of HD Voice even better. HD Voice is a premium call quality via your mobile phone. It does not cost you anything, you just need a compatible device and an operator. Dialog Axiata PLC, the leading connectivity provider in Sri Lanka, was the first to launch the WiFi Calling service in Sri Lanka, which allows subscribers with VoWiFi enabled handsets to connect to a WiFi network and make or receive calls from mobile numbers and landlines to standard local calling rates. Currently, the Huawei P20 Pro, P20, P20 Lite, Nova 3 and Nova 3i support this technology on the Dialog network, while the service will be extended to other VoWiFi compatible handsets, including Apple and Samsung. According to Diaolog, customers can activate the VoWiFi service on their mobile by dialing #107#. Mobile phones can switch to VoLTE (Voice over LTE - 4G Voice) when WiFi signals are weak, without interrupting the call. Similarly, a call on VoLTE can switch to WiFi when connectivity is available, without interrupting the call. For a brief description on how to enable WiFi calling on your Android device, watch the following video.